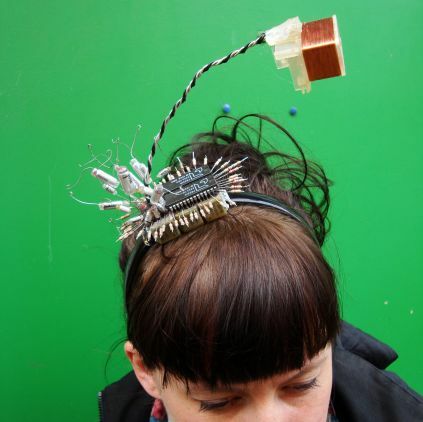 KÖRPER SPULE is a workshop in which participants build a wearable device (from re-purposed objects) that makes electromagnetic fields audible and go into the city to explore these invisible fields. Participants are expected to bring an old electronic object (preferably with coils in it) to dismantle. The coils are re-purposed as pick up microphones (mics that ‘listen to’ electromagnetic frequencies). 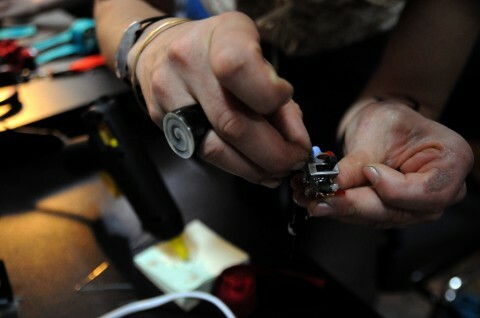 Participants then build an amplifier by soldering components to a self-designed copper sheet cut-out circuit. This circuit is built directly onto the body’s surface. The workshop ends with a walk through the Museumsquartier. KÖRPER SPULE is about understanding how things work, breaking things open, working with the physical leftovers of planned obsolescence, and re-incarnating old components. It is also about exploring the hidden world of omnipresent electromagnetic waves.